LEXINGTON- In keeping with Kentucky Farm Bureau’s (KFB) efforts to continually provide learning opportunities to its members, this year’s Young Farmer (YF) Leadership Conference hosted nearly 300 attendees for a weekend filled with educational workshops, tours, and the chance to network with each other, as well as state ag leaders. KFB President Mark Haney addressed the gathering and said helping a younger generation remain on, or come to the farm, is critical to the success of the industry here and across the country. KFB State Young Farmer Chair Tyler Ferguson speaks to attendees at the 2019 KFB Young Farmer Leadership Conference. 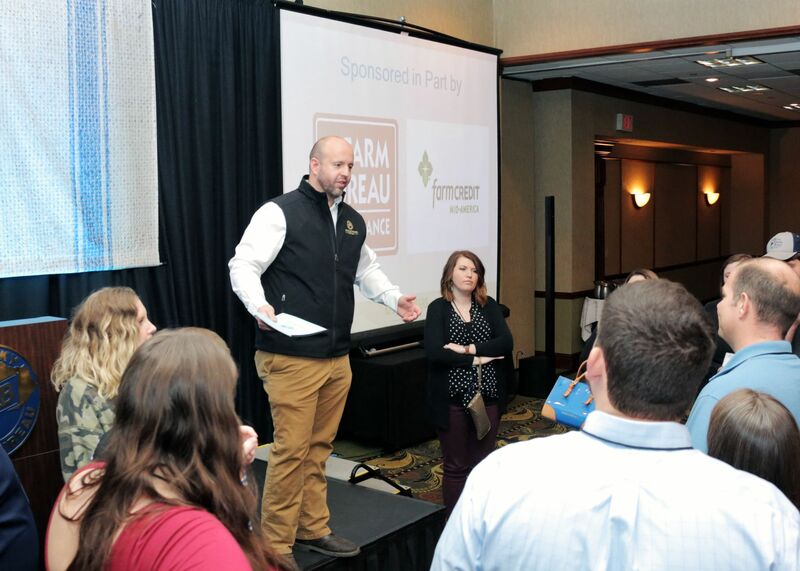 Tyler Ferguson, the 2019 State Young Farmer Committee Chair said these types of meetings help to encourage these young farm families even in trying times. The Ferguson farm consists of a cow-calf operation in Johnson County utilizing reclaimed strip-mine land as pastures for livestock. Additionally, Tyler and his wife Andrea have a direct beef marketing business. In maintaining such operations, he said educating oneself is paramount in remaining sustainable. And from a business perspective, Ferguson added, gaining those leadership skills is something that makes their hometowns better. “Any time we can improve our rural communities, all of our ag-related industries, including our farms, have a better chance of being successful,” he said. Each year, the YF Leadership Conference includes a variety of workshops on a number of subjects all designed to enhance the learning opportunities available to attendees including one for the children. This year, workshop subjects included farm vehicle regulations on the road; learning the best times to purchase new equipment and supplies for the farm; adding value to a livestock operation through a CSA; finding ways to diversify operations; drone technology; personal safety and self-defense; telling your story through social media; and the basics of canning. In addition to hearing from Mark Haney and Tyler Ferguson, attendees also heard from an array of speakers including renowned author, farmer, and radio/television broadcaster Andrew McCrea, along with Keni Thomas, a former U.S. Army Ranger Veteran and motivational speaker. Legislatively, Kentucky House Speaker Pro-Tempore David Meade spoke to the gathering after policy issues were discussed by KFB Director of Public Affairs Jeff Harper. Agriculture Commissioner Ryan Quarles served as the keynote speaker on day-one and KFB First Vice President Eddie Melton brought greetings on day-two.